As a Civil engineer myself I wanted to promote engineering to young people mainly by supporting school events and career fairs. Engineering is not seen as a popular career path for young women. This is something I would like to help change in order to improve diversity in the engineering professions. I studied at Greenwich University BEng (Hons) Civil Engineering. 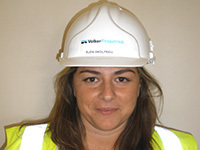 I joined Volkerfitzpatrick as graduate engineer in 2003 which I still work for. I undoubtedly think I made the right choice as I find being involved in solving problems during the design and construction process and then actually seeing the projects built is extremely rewarding. Being a STEM ambassador its great, as it gives you the chance to share work experience and knowledge and turning it in an interesting story to tell school children. It is also very rewarding to know that I have contributed to help and advice school children and make them see civil engineering differently. "Engineering is not seen as a popular career path for young women. This is something I would like to help change in order to improve diversity..."